After cleaning out each of the elephant’s personal areas, the team got to feed and touch the elephants. What an experience! Here is Dina feeding Ellie the elephant. There are many words which can be used to describe today and the rest of my time here in Malaysia, a select few of those words would be: incredible, surreal, spectacular… The list goes on, but most of all: humid. The humidity has been a real challenge for all of us; we’ve found ourselves running from one air-conditioned building to the next, and so on. Luckily this morning, after a 6am start, we had our first experience of a partially bearable outdoor temperature. The reason for the early start was due to a fieldtrip to one of TIME’s cable landing stations (CLS). 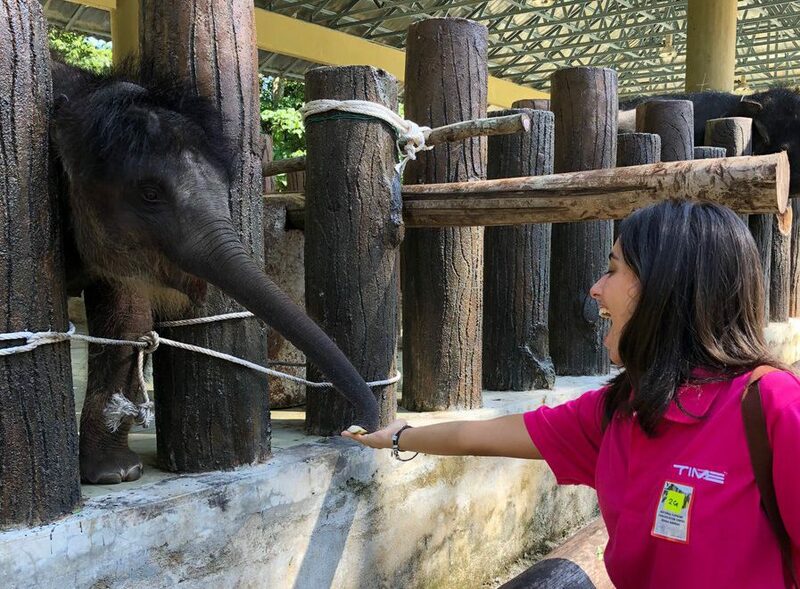 Excitement and anticipation was in the air, as we had found out on a previous day that our TIME coordinator Mizi had arranged for us to visit the Kuala Gandah National Elephant Conservation Centre (which TIME has supported in the past) on the way to the CLS. A big reason for our excitement was that we could partake in feeding the elephants. On the way to the elephant sanctuary, everyone was trying to get a few extra hours of sleep on the bus. Myself, however, I enjoyed looking at the Malaysian countryside. It was interesting being able to see things that I had only previously heard about. Walking around central KL during the week, Mizi had told me about the typical Malaysian houses, built on stilts in order to cope with flooding during the rainy season. And indeed, some (not all) Malaysian houses were built on stilts. It was also interesting to see all the palm oil plantations, stretching from one side of the country to the other. Malaysia is known for its palm oil exports, therefore, a vast amount of Malaysian countryside is taken with the production and exportation of palm oil; this was very clear today. When we arrived at the elephant sanctuary everyone jumped into action. We had to earn the privilege of interacting with the elephants first by cleaning their living areas. During this process we were told about the type of elephants they have at the sanctuary, their daily routines and how they all ended up there. Once we were done with cleaning, we were able to walk around the sanctuary feeding the elephants. We fed them sugarcane and watermelon, a mere snack to the elephants as we were informed that the largest elephant in the sanctuary can eat up to 150 kilograms per day. The whole experience with the elephants was incredibly surreal, I was in a constant state of bewilderment; I’ve never been so close to an elephant let alone feed and touch them. We were told that elephants like being touched (when they are comfortable) as it’s in their nature, being the sociable animals that they are. The baby elephants were particularly playful and fun to be around. But after a few hours we were back on our way to TIME’s CLS in Kuantan on the east coast. When we arrived at the CLS we met Parthiban, who explained how the Kuantan CLS works and where the other cable landing stations were located. The Kuantan CLS connects west Malaysia to east Malaysia (Borneo) through a submarine fibre optic cable. The CLS Is the Malaysian landing point of their Asia Pacific Gateway (APG) network, a submarine fibre optic network from Malaysia to Japan connecting Thailand, Vietnam, China and countries alike. Although the facility is equipped to serve four submarine cables currently it only carries the two networks mentioned above. 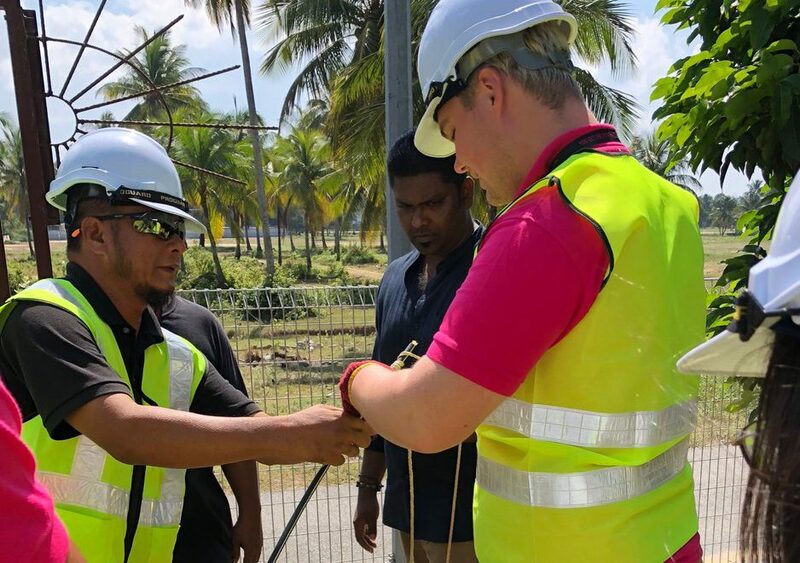 At the CLS we were given an introduction into installing fibre optic cables on land, splicing high fibre optic cables together and testing connections on the network. I thought this was a great activity because, as an engineer, I always appreciate hands on experience. The whole team were engaged during these activities and we all feel like we’ve learnt so much more about fibre optics, how they are installed and how they work.